Slow Cooker Spicy Touchdown Chili - hamburger, sausage, bacon, pinto beans, Ro*Tel, onion, chili powder, cumin, garlic, basil and cayenne slow cook all day in the crockpot. It has a kick! Use mild Ro*Tel if you are sensitive to heat. Makes a ton - great for a crowd! Serve with cornbread for an easy potluck meal! It is finally cooling off here in Alabama. That means it is time for chili!! 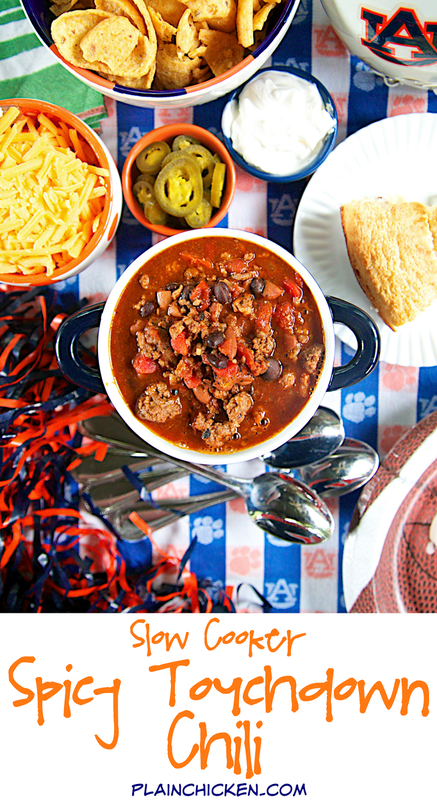 This Spicy Touchdown Chili is perfect for watching football! 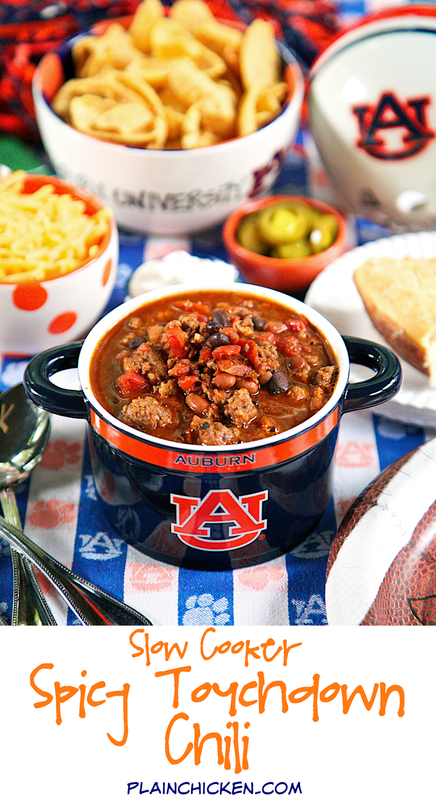 I love to make chili for tailgate parties. 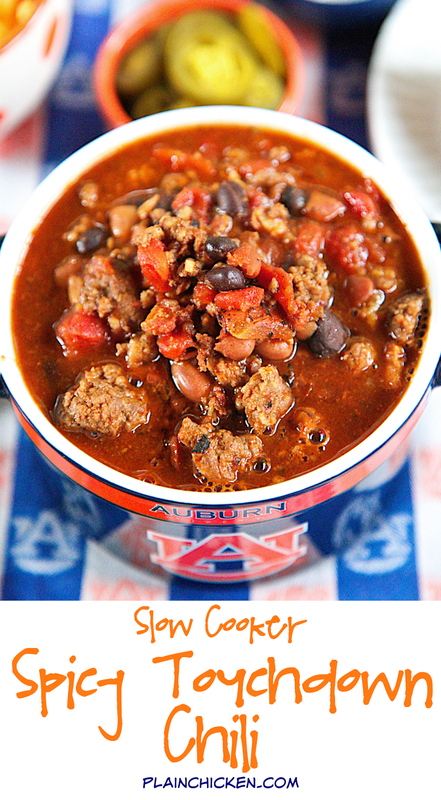 Chili feeds a crowd and is super easy to make in the slow cooker. Just dump everything in the slow cooker and let it do all the work! 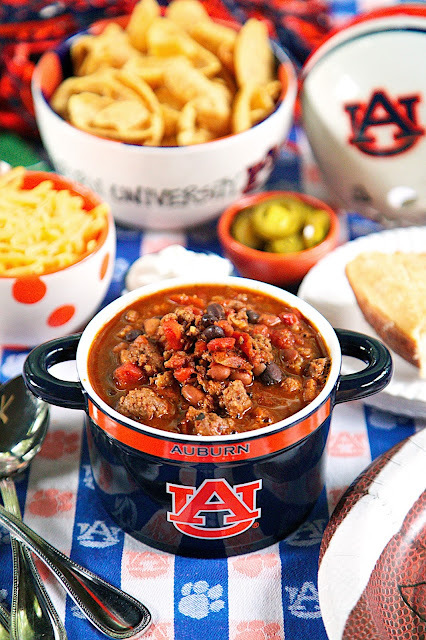 We served this chili at our tailgate last weekend and it was a big hit. It was super easy to make and clean up was a breeze with my InSinkErator Evolution Excel garbage disposal. I only spent about 10 minutes total on cooking and cleaning up for the party. LOVE!! 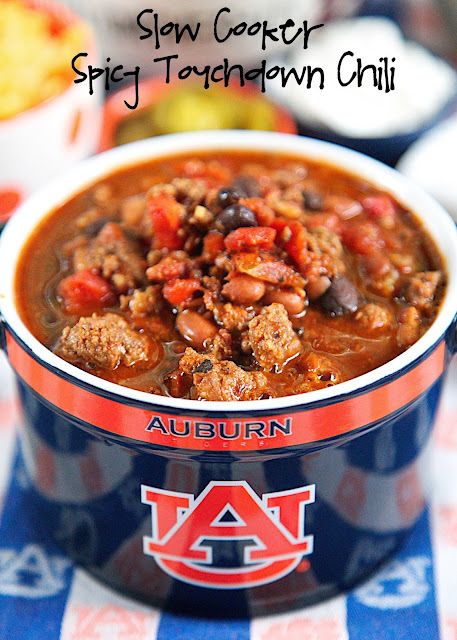 This Spicy Touchdown Chili is one of the best I've ever made. It has three types of meat and, as you might guess, has a little kick to it. There are a few of cans of Ro*Tel in the chili. If you are sensitive to heat, make sure to use mild Ro*Tel. We love to serve our chili with some sour cream, jalapeños, cheese and Fritos. I also make a big pan of homemade cornbread to go with the chili. We always have cornbread with our chili. You can get my "go-to" cornbread recipe here: http://www.plainchicken.com/2009/11/southern-cornbread.html It is my Mom's cornbread recipe and it is wonderful! In a large skillet, cook ground beef and pork sausage over medium heat until no longer pink. Drain fat. Add meat to slow cooker. Stir in remaining ingredients. Cover and cook on LOW for 5 to 6 hours. Top with sour cream, jalapeños, cheese and Fritos. Looks really good Steph and I like the bacon pieces added to it. We made a big pot of chili here yesterday. Roll Tide! Sorry, I couldn't help myself! The chili looks delicious. Will be making this for our next work luncheon.